*Rapper Afroman is facing legal action for allegedly failing to show up at a concert in Columbus, Ohio earlier this month. The artist, best known for his comedic hit “Because I Got High,” was reportedly due to perform at the city’s Patio venue on April 9, but a lawsuit filed Wednesday by promoters alleges he never made it to the concert. 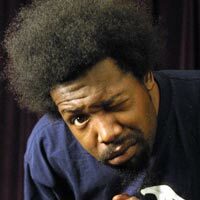 Ironically filed on April 20 – America’s unofficial National Pot Smoking Day – the lawsuit states that concert promoter Nathan Pettry paid Afroman a $1,000 deposit to secure him for a performance at the Patio. Pettry and Wallace Entertainment, LLC, owners of the Patio, are seeking compensation for the deposit paid to Afroman, as well as promotional expenses, lost profits and the cost of ticket refunds, according to the Los Angeles Times. Maybe he didn’t show up because he was high.